This is rather a sad post to be composing with Mothering Sunday this weekend. 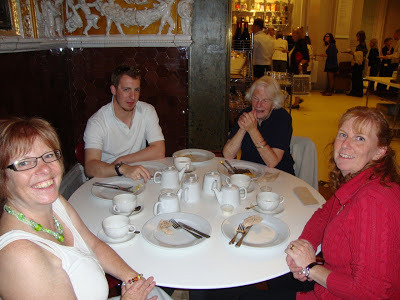 It is a week today since Mummy died suddenly and completely unexpectedly on 1st March. She never enjoyed having her picture taken but I managed to find these two, taken when we visited the Quilt Exhibition at the V&A. 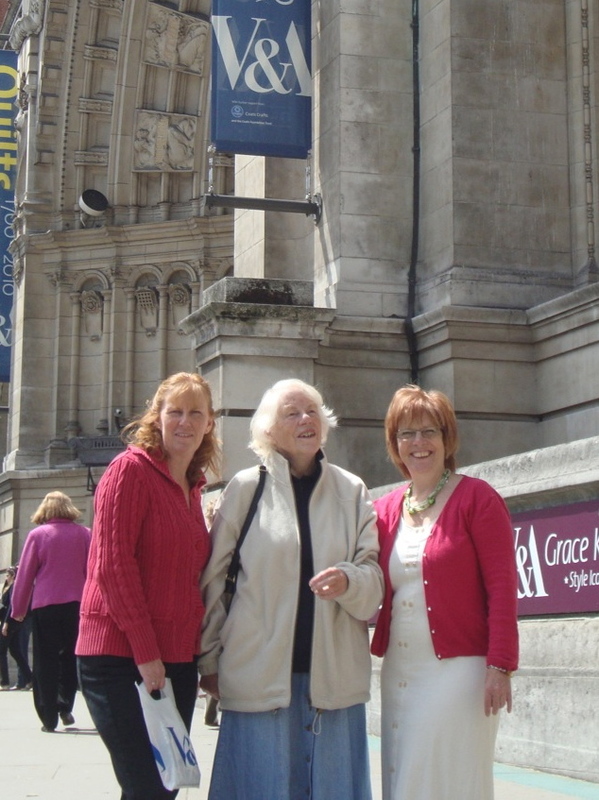 The picture above shows my sister, Jane, Mummy and me. The photo below shows us joined by my DS David for lunch. At the moment everything seems so surreal. Mummy suffered a spontaneous intracerebral haemorrhage and wouldn't have known anything about her trip to hospital, the attempt to harvest some of her organs or the final visit we made to say goodbye. For her it was a perfect way to leave, no fuss, no pain. For us? Well I think we are all still in shock. So sorry for you and the family, Lis. If she had to go as you said it's a good way to do it.Lots of love coming to you from the antipodes. I am so sorry to hear about your loss, knowing that you could have met up when you went to London just a couple of weeks earlier. Sorry for your loss. Sending wishes that you will find the comfort you need at this sad time. I am so terribly sorry for your loss and nothing I can say will help in any way to ease your pain - my thoughts and prayers are with you all. What a shock that must have been. I'm so sorry for your loss. The pictures are great reminders of those happy times you shared so recently. Hugs and prayers coming your way. Oh Lis, how sad for you all. We are so sorry to hear the sad news on the loss of your beloved Mum. Sending warm Kiwi hugs from jJenny and Robin. Your Mum was one day younger than my Dad is. Lis, I lost my mother too 1 month ago (but she was much older than yours and very sick). All my love dear friend. Sorry to hear your sad news. So sorry.